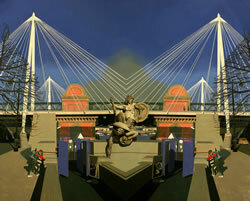 At first, casual, glance the immaculate, architectural precision and clear, uncluttered surfaces of David Piddock's views, vistas and panoramas of London's riverscape seem to place his work very much within a tradition that stretches right back to the 18th Century - Canaletto and Samuel Scott's London views for example - all the way up to the photorealism of modern times, best typified in this country today perhaps by the icy glitter of Ben Johnson's paintings of both historical and contemporary interiors and townscapes. 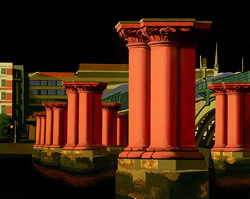 David Piddock's latest work is dominated by a series of panoramic urban landscapes that make innovative use of perspective, employing rotating viewpoints some of which turn the full 360 degrees. The paintings make combined use of drawing, photography and software to create images that blend past and present, fact and fiction. 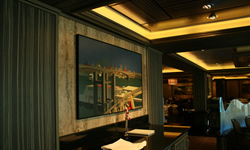 At the beginning of 2009 David Piddock was commissioned by P&O, through the agent Tom Tempest Radford, to paint a series of fourteen pictures for the exclusive restaurant 'Seventeen' on board their newly built super-liner 'The Azura'. The paintings took 10 months to complete and were delivered at the end of the same year. The ship set sail on its maiden voyage in the April of 2010. 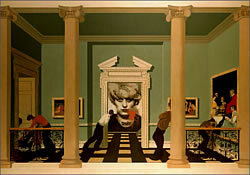 Gone for now are the impossible perspectives and disconcerting spaces of the last series of paintings, replaced by an altogether more classical framework. The new series reads like a contemporary take on PIERO DELLA FRANCESCA: emphatic verticals and horizontals, strong surface pattern, carefully judged intervals and restrained detail balanced with a broader description of form. 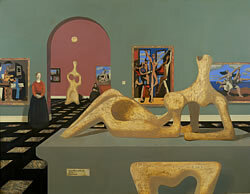 In his INTRODUCTION to the catalogue for my last show, John Russell Taylor described my work as Magic Realism. It's a term that's more often used these days to describe a genre of literature with a supernatural dimension - often darkly comic - dealing with themes such as love, grief and obsession. Given this definition, it could be reasonably applied to the work in this show. 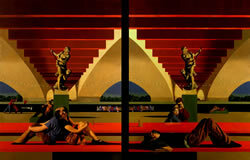 "This edgy mixture of reality and fantasy produces a curious and distinctive atmosphere in Piddock's work. In some ways it reminds one of the mysterious, deserted neo-classical towns of de Chirico's imagination. If this is realism, then it is magic realism, illuminated by the light that never was, on land or sea." 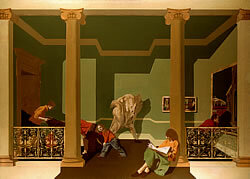 Bought by the Museum of London in 2000 and hung in an exhibition of new acquisitions in 2001, this painting was earmarked for display in the museum's planned new 20th Century Gallery. 'Art Sabotage' focuses on the moment when a visitor to the Saatchi/Royal Academy exhibition 'Sensation' vandalised Marcus Harvey's painting 'Myra'. Piddock's version of events mixes fact and fiction. "Sometimes the characters or their emotions seem to escape from the artworks and rampage around the building. Sometimes the opposite is the case: titanic convulsions may be happening on the walls around them but the visitors remain sublimely unaffected... His works are beautifully painted, full of tonal and textural subtleties... Post Modernism with wit, skill and no pretensions..."